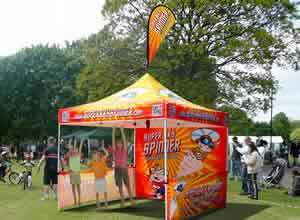 Pop Up Tents and Event advertising tents are an ideal way to show off your company at any event. They are always a big hit and huge attraction but which tent do you choose? By asking yourself the following questions, you will be guided into the perfect event tent or advertising tent for your event, show or gathering. 1) How big is my event? 2) How big will my tent need to be? 3) How many people will my event tent need to shade? 4) What do you expect the weather to be like on the day of your event/s? 5) How many events or times will you be using your event tent ? 6) How durable do I need my tent to be ? 7) How many people can I utilize to have to set up my event? 8) How much budget do I have for my event? 9) Where will I store your event tent? 10) How much print do I want on my tent ? Above All Advertising, Inc will help guide you through these questions and help point you in the right direction to making our event / show a great success. 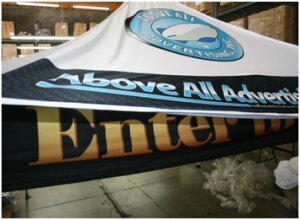 Whether you chose a Rigid Pop Up Event Tent / Canopy, inflatable tent, Spider tent, Teppee Star tent, Action Tent Aire Cap™ or another style, you're covered with Above All Advertising, Inc.
With this unique tent, you are sure to draw attention from everyone around! It's 20ft high and 40ft wide, giving you lots of space and shade to entertain your potential customers. This star shaped peaked tent is secured in the ground stakes and has one support pole. Remember, these are primarily designed for grass or dirt and if you plan to set them up on a hard surface, you might need to drill holes to properly securen The Teppee™ or Tent does require a few hands set up but with the right personal and the correct ground they are easy and efficient to assemble. 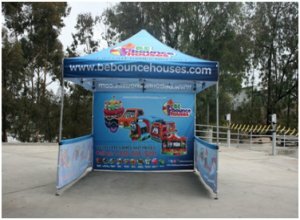 With full color digital printing options, this tent will ensure that your business is the center of attention! The Spider Tent ™ is one of our most popular inflatable tents because of all the attention that it draws! This inflatable tent provided a great amount of shade and space to work in. It great for set up and only requires 3 -8 people depending on the size you buy. This tent comes with fan system, carry bag and instructions to help you on your way to setting up these awesome tents. Oh.. Did I mention that these are some of the coolest looking and highest quality inflatable tents around ? Well, that they are !! Above All Advertising offers custom sizes for the Spider Tent. Our most popular / stock sizes are 20 feet, 25 feet, 30 feet and 40 feet traditionally. The coolest thing about these tents is that they make such a powerful statement, you're sure to be noticed and remembered! This fun inflatable tent is sure to enhance your business! 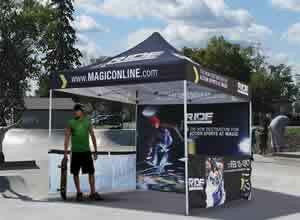 These one of a kind action tents offer continuous visibility of your logo or company name! Made from robust aluminum and polyester tent top, they have look which is very unique and quite frankly, striking. The Frame fits together nicely and is of high quality. The custom made canopy top also has quality built into every stitch and we're sure you'll be impressed! Set up is not as easy as the spider tent but not too tough either. We recommend 3 people to set up the smaller sizes and 4-5 people for set up the larger sizes. We offer removable zip up walls if wanted and three sizes to fit all of your needs! There is a 9 foot, 13.5 foot and 18 foot option. 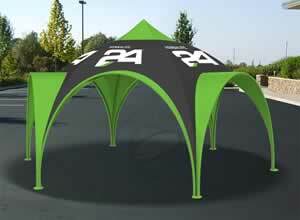 This tent draws attention with its unique shape, and is sure to bring more business! This cold air inflatable tent is a great venue for branding as well as providing shelter from the elements! Since this tent is a cold air inflatable, electricity is required. The dome shape is eye catching, and adding your company graphics will only add to the attraction of this fabulous tent. 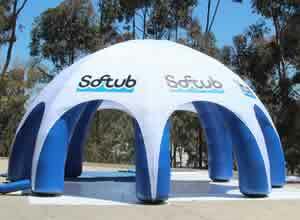 Also known as the Igloo, Golf or Helmet tent, this tent is well known in the advertising world! Call your local sales rep today for more information on this well desired tent. The Chamber Aire™ Tent is different, unique, eye catching designed with "different" in mind. This is a sealed air tent that offered continuous visibility of your desired graphics. This tent is available with up to 4 detachable side walls. This tent has many benefits, including being lightweight, portable, durable, and affordable. The best part about this tent is that this tent I customizable to your needs! Our sales rep and art department will work with you to ensure your image is created. When deciding on a pop up tents provider, the main factors for consideration in our view should be: QUALITY - RELIABILITY AND PRICE. Oh yeah and… OVERAL VALUE! We provide 4 levels of frames and tops to choose from. From the entry level retail quality all the way up to the heaviest duty products available on the market, we have you covered. Apples for Apples, we're certain that you will be happy with us. 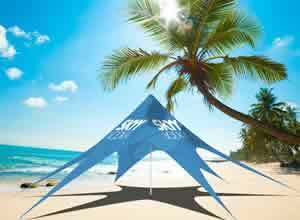 Our Pop-up tents are by far our most sought after products. In addition to frame and top options we alos offer op up tent canopies and frames in a wide array of sizes: 5 x 5 - 10 x10 -10x 15 -10 x 20 and 20 x 20.. WOW, a 20 x 20 pop up tent.. Yup, that's no typo.. Contact your sales rep today to discuss your Pop Up and rigid canopy tent requirements! The 1 Plex ™ was born out of necessity to be Above All. What do you do when you're in a sea of tents and want to stand out. GO ABOVE ALL and add a flagt to the top. Well, that's exactly what we invented. A flag which sits perfectly on the top of your tent with our Patent Pending 1Plex™ system. This product is REAL value for money, especially when you consider all that additional exposure you get when you really stand out from your neighbors and go ABOVE ALL :.. 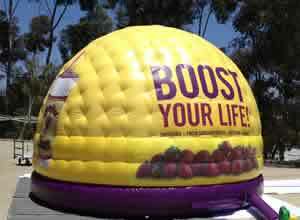 The Original Flex Blade™ Topper is sure to grab attention in a crowd! We offer the 6 foot flex blade for tents small to large! In this amazing deal, you get the benefits of a Pop Up Tent ™ and a Flex Blade ® all in one! Here at Above All Advertising, we understand that if it's not broken - don't fix it! Our Canopy Caps™ - Patent Pending are the perfect solution for anyone who is looking to replace an old, worn out canopy. 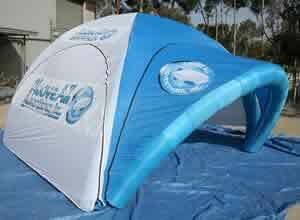 We fit Pop Up Tents of all sizes and shapes and add your own customizable graphics! If you are in love with your Canopy frame and are looking for a new way to fix up that old tent, our Canopy Caps™ are the answer! If you want a Pop Up Tent with all the bells and whistles, the back and side walls are for you! These additional tent accessories really give the whole display a professional feel. We offer a full back wall and 1/3 side walls. The sky is the limit with these re-attachable walls! This is a special option available for all Pop Up Tents™! This is a full double sided graphic topper. It is 2.5 feet by 5 feet. With this Pop Top™ you are sure to grab the attention of anyone walking by! This is perfect for trade shows, flea markets, sales events, race water stations or check-ins, beer gardens, wine tastings, food sales, etc! Get your one of a kind Pop Top™ from your local sales rep today! Above All Advertising, Inc will help guide you through these questions and help point you in the right direction to making YOUR event / show a great success. 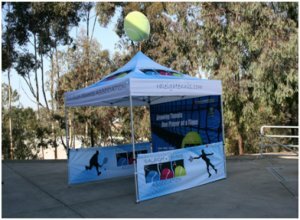 Whether you CHOOSE a Rigid Pop Up Event Tent / Canopy, inflatable tent, Spider tent, TEEPEE Star tent, Action Tent Aire Cap™ or another style, you're covered with Above All Advertising, Inc.
We look forward to working with you and guiding you towards a successful event.